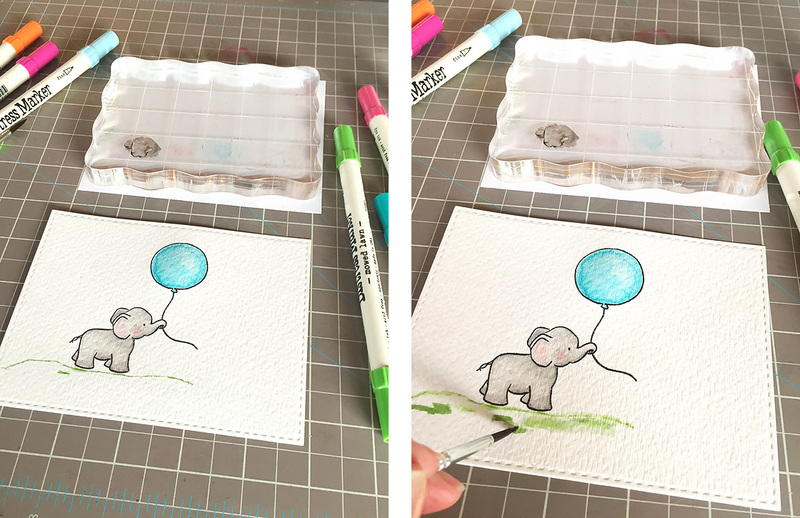 Today I'm sharing how to watercolor a cute little scene on your card even if you're not an artist. Starting with some adorable stamps will make you look like a pro. I am so excited about WPlus9's Unforgettable stamp set! 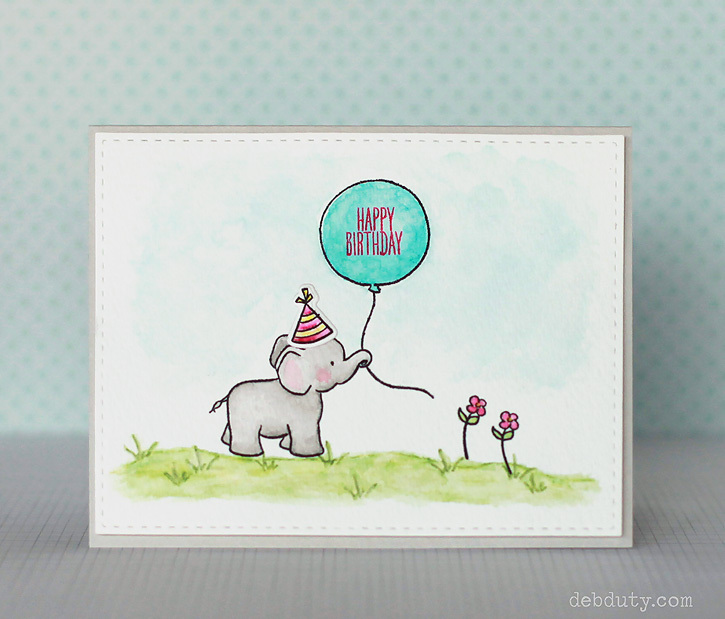 Such a cute elephant, and I love the balloon too. I prefer round balloons over oval, and this one is perfection! 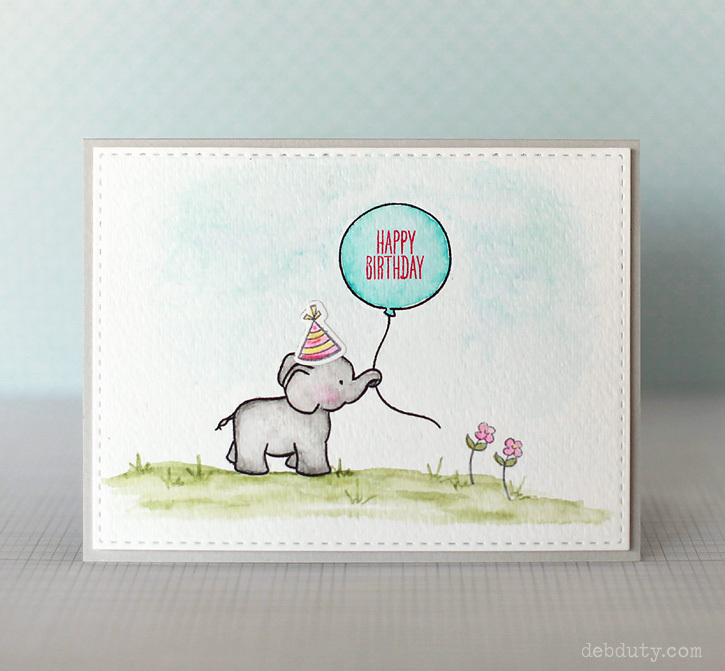 Here's my card with the scene of the little elephant and his balloon. 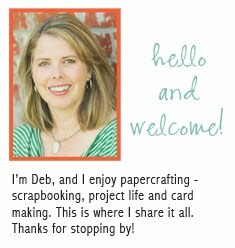 The card base is Simon Says Stamp fog cardstock cut to a standard A2 card, 4 1/4 x 5 1/2". 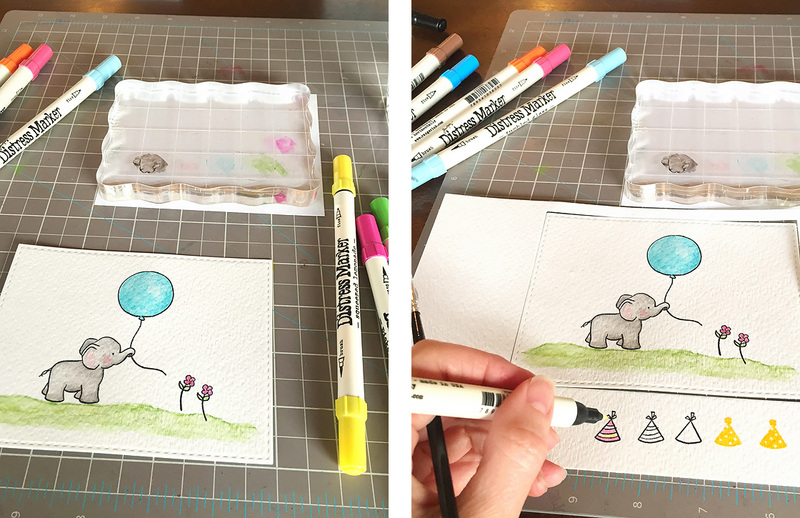 I used Strathmore watercolor paper for my scene and cut it with the Simon stitched rectangle die. I love the size of this die because it leaves a perfect narrow border on an A2 card. Here are details on how this card came together. I can tell you it was a lot of fun to make! I ended up making two cards so you may notice subtle differences in the finished card shown above and the process photos. 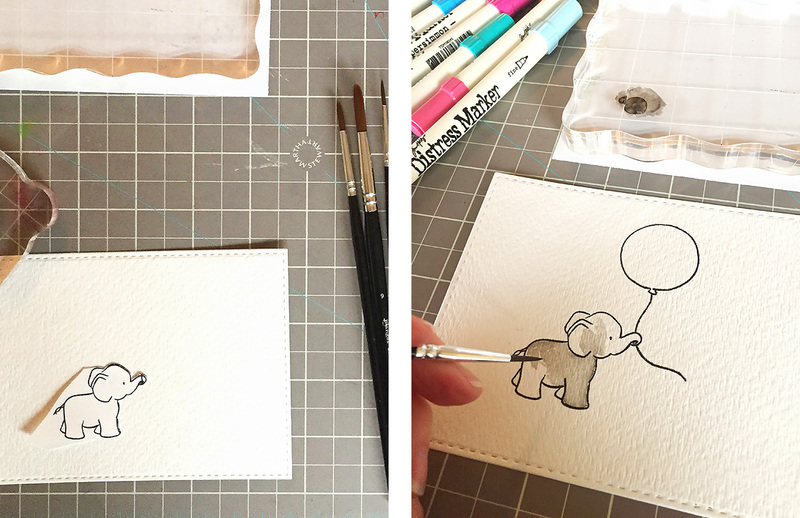 I stamped the elephant on the watercolor paper with Ranger Archival ink (because it's waterproof) and again on scratch paper. I cut around his trunk to use it as a mask. 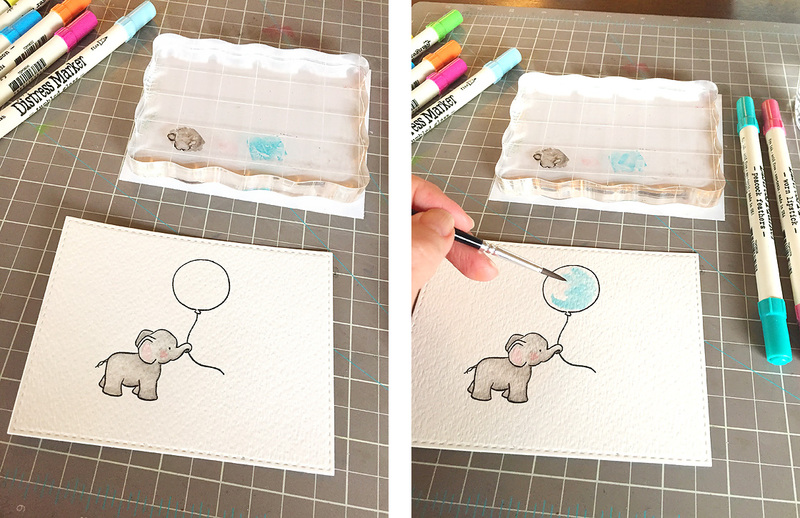 I placed the mask over the elephant so that the balloon string wouldn't stamp on top of his trunk. I used distress markers for the watercoloring. I scribbled the markers on an acrylic block and painted with a wet paintbrush. I added more water as needed to soften and blend the color. I first painted the elephant all over with a black soot distress marker watered down to a light grey. I then gradually added more color until I had a little shading on the elephant. I used a tiny bit of worn lipstick on the elephant's cheek and ear. Next I painted the balloon with peacock feathers. For the grass I used mowed lawn and colored with the marker directly on my paper, and added water with the paintbrush to spread and soften the color. I also picked up extra color from the scribbled green ink as needed. Next I stamped and colored in the flowers on my scene with picked raspberry and squeezed lemonade. I also stamped and colored the party hat with the same pink and yellow and cut it out with the matching die. I used the little sprigs of grass included with the stamp set to add detail to my grass. I colored directly onto the stamp with my mowed lawn distress marker and stamped on the grass in my scene. I then softened the grass by going over it with a wet paintbrush. Last I prepared the surface for the sky by brushing on water first. I added tumbled glass ink a little at a time for a subtle sky. After I let the paper dry for a few minutes I stamped Happy Birthday onto the balloon with flamingo color theory ink. The card was slightly warped from all of the water so I ran it through my die cut machine with no dies. This works great to flatten out warped paper. Then I adhered the party hat to the elephant and the whole scene to the card base with foam adhesive. Here's the second completed card. Can you see the subtle differences? 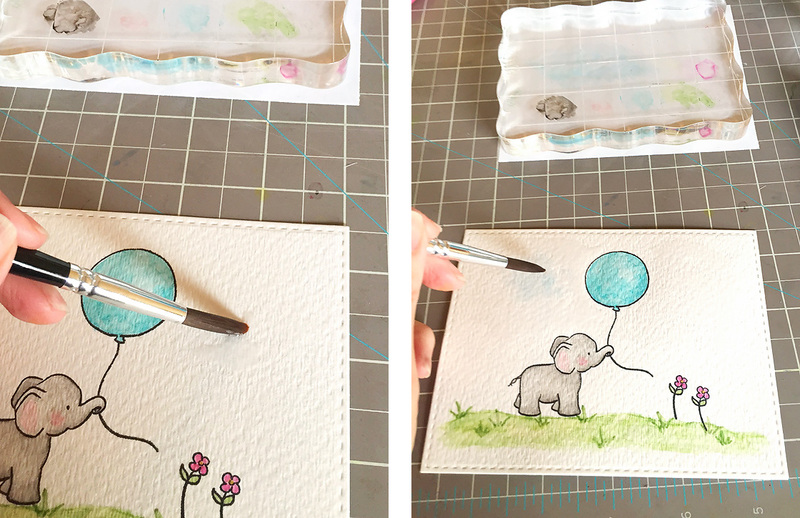 Be sure to check out this video on WPlus9's youtube channel if you'd like to watch Dawn of WPlus9 painting this cute elephant. I was completely inspired by her. The video is fabulous and her card is just gorgeous! I'm linking up at the Simon Says Stamp Monday Challenge Blog. Check it out for lots of inspiration! The supplies used on today's card are linked below. I adore this! Thanks for the step-by-step! Amazing, you are so good at water colouring, it looks like a bought card. oh my goodness, i love everything about this card! 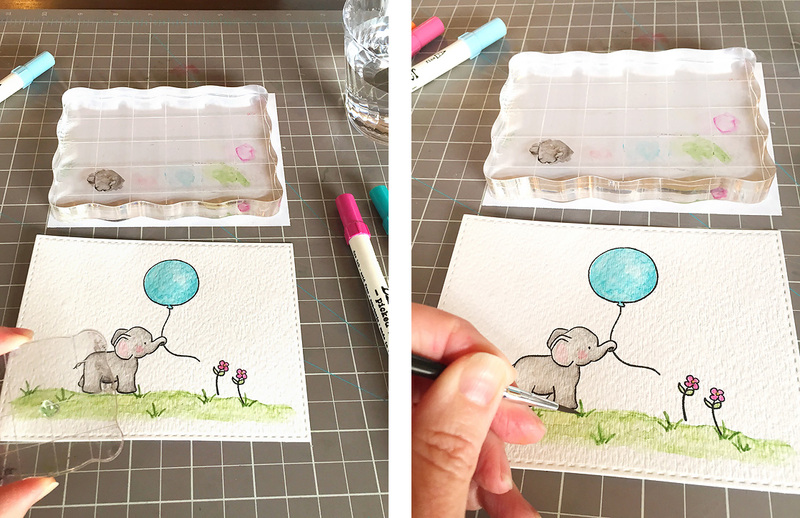 I love , love your watercoloring, you make it look so easy;) Fantastic card!! This is so sweet and so cute!! This is adorable! Your coloring is fabulous. Beautifully done! Thank you for sharing your project with us this week for the Simon Says Stamp Monday Challenge.